Getting up to speed! Baked two stollen and they are safely tucked away in the freezer... is that coming close to time management? I noticed I mentioned my stollen last year but only posted a photo and never wrote down the recipe. I must say that the other one looked prettier, filling more evenly spaced but that doesn't interfere with flavour I think. mixed candied fruit like cranberries, apple, orange, kiwi etc. approx. 250 grams of almond paste, loosened with a fork using half of a beaten egg. Roll and pat into a rope. Set aside. There are two ways to continue, one is to knead the filling right into the mixed dough and set aside to rise, punch down, form and second rise. Another is mixing the dough, let it develop until distinctly puffy and then knead the filling in and let it rise again. I've used both methods and tend to lean towards the second. It will leave you with an extra fermenting period but to me it seems the dough is easier to handle and the filling more evenly spread throughout the bread. Find out for yourself what suits you. 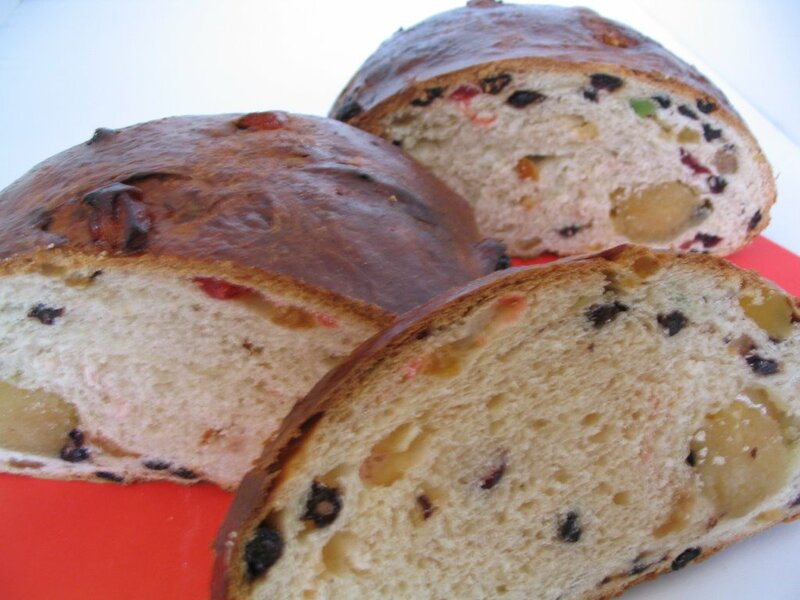 Either way you're rewarded with a great tasting stollen. In a small bowl, dissolve yeast in warm milk. Let stand until creamy, about 10 minutes. 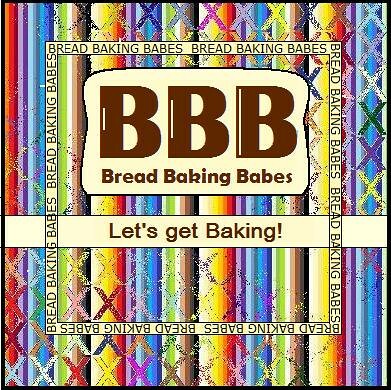 In a large bowl, combine the yeast mixture with the egg, white sugar, salt, butter, and 2 cups bread flour; beat well. Add the remaining flour, 1/4 cup at a time, stirring well after each addition. When the dough has begun to pull together, turn it out onto a lightly floured surface, and knead in the currants, raisins, dried fruit, and citrus peel. Continue kneading until smooth (about 8 minutes by hand). Lightly oil a large bowl, place the dough in the bowl, and turn to coat with oil. Cover with a damp cloth and let rise in a warm place until doubled in volume, about 1 to 2 hours. Or....Once the dough becomes puffy (not necessarily doubled), knead in the raisin mixture and almonds. Knead carefully until well mixed. Lightly oil a large bowl, place the dough in the bowl, and turn to coat with oil. Cover with a damp cloth and let rise in a warm place until doubled in volume, about 1 to 2 hours. Don't punch down the dough completely but divide in two and without turning each piece into a ball again, transfer to a lightly floured surface. Using your hands, shape each piece of dough into an oval and place the almond rope slightly off the center of each oval. Fold one -smaller- side of the dough over the almond rope and fold over the remaining half over the top so the top half overlaps to within 1/2 inch of the bottom half. Press the seam down lightly; do not seal. Transfer to a baking sheet, cover and let rise one hour. Preheat oven to 350 degrees f (175 degrees c). Bake in the preheated oven for 10 minutes, then reduce heat to 300 degrees f (150 degrees c), and bake for a further 30 to 40 minutes, or until golden brown. Allow loaf to cool on a wire rack. Prior to serving, dust the cooled loaf with confectioners' sugar. Golly, I've never had the need to even think about baking my mother-in-laws stollen but now I have the desire. Yours is so beautiful looking. Tell me, do you use dry yeast or instant yeast in this recipe? ?